Highlight several of your hobbies at once in your garden with the Whitehall Fisherboy Sundial Bird Bath and Pedestal combination. This fantastic, aluminum bird bath and matching pedestal bring a charming look to your backyard, and help you care for your feathered friends. The Whitehall Aluminum Fisherboy Sundial Bird Bath has a 10.5" diameter basin, providing plenty of water for songbirds, and its soft bronze color offers an elegant look. A 1" wide rim surrounds this basin and sports Roman numerals, creating the clock face. A narrow platform extends into the bath and resembles a dock, completed with a young boy figurine sitting at its edge and holding a fishing rod. This adorable accent not only captures attention; the rod also forms a gnomon, casting a shadow over the numerals to create a working sundial. 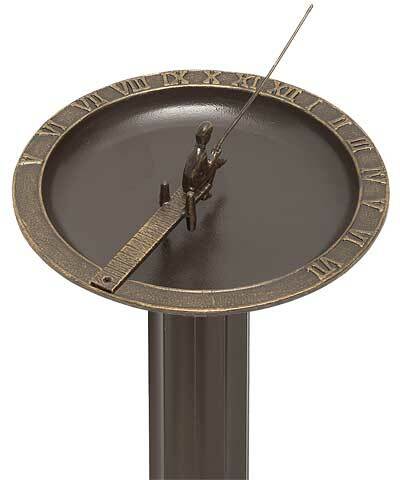 Place this bath on the included Whitehall Aluminum Roman Sundial Pedestal for a wonderful focal point. A scalloped design on the pedestal lends classic style to your yard, furthered by braided detailing on the 8" diameter base. Included hardware keeps this stand stable in stone or concrete, or pipe (not included) may be used in the hollow body to secure it in your yard. The bath perfectly rests on the flat top of this pedestal, and the bronze colors throughout each unit add traditional style to your landscaping. The all aluminum construction lasts for many seasons without rusting or degrading. Showcase fishing, birding, and timekeeping at once with this Fisherboy Sundial Bird Bath and Pedestal. Assembly required. Bath and pedestal made in the USA.